Who doesn't like a toy at Christmas? Festive, fun, safe, entertaining & stimulating Christmas Parrot Toys. Wide range of Christmas Themed parrot toys. 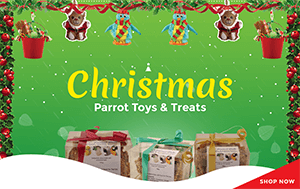 Give your pet the Christmas it deserves with our range of toys, treats and novelty gifts for parrots & birds. Order now for Fast & Free Delivery!